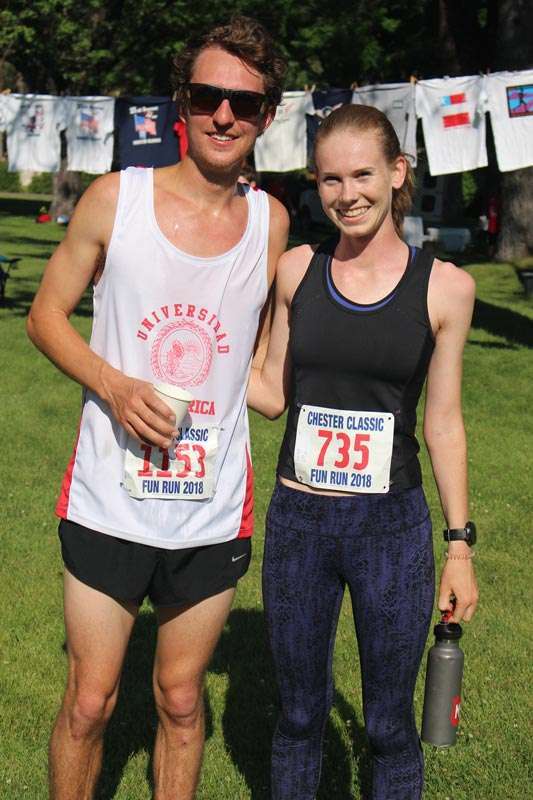 Matt Paulsen, 22, of Reno, with a time of 18:21.5 took first place in the men’s division, with Britta Bundy, 17, of Chico, winning first place in the women’s division with a time of 21:46.2. 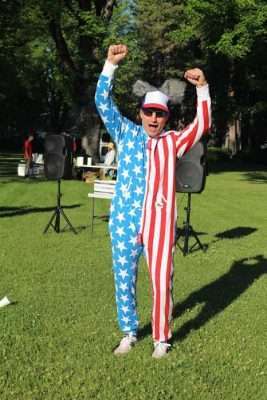 It looks like this year’s 39th Chester Classic 4th of July Fun Run & Walk broke its own record, with a total of 680 runners vying for first place, or at least showing they had what it takes to finish the looped 3.25-mile route on Independence Day in downtown Chester. Local sprinters as well as many from around the country converged early Wednesday morning on the Collins Pine lawn on Main Street in Chester to compete — or just to participate for the fun of it. 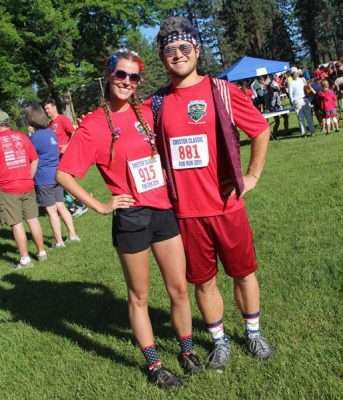 Many of the runners were dressed in wild or patriotic costumes. 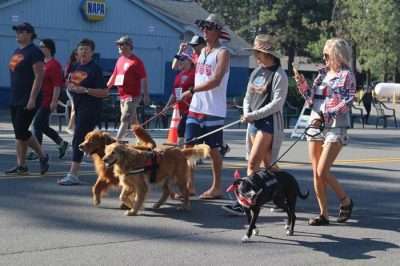 The event kicks off the Fourth of July Parade each year; both events increase visibility to the area, promoting the Lake Almanor Basin as an exciting destination. Considering that the run was held on a Wednesday this year, the number of runners that registered and actually showed up proved just how popular the foot race is, stated Almanor Recreation and Park District board member and race director Shane Bergmann. 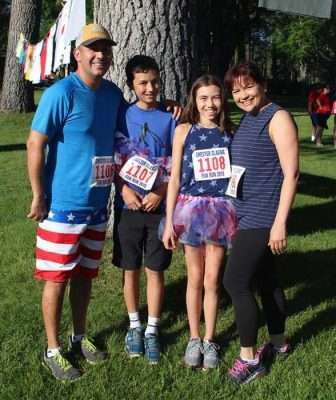 Bergmann and his wife Dolores coordinate the ARPD-sponsored event to raise funds to provide both recreational and educational programs benefitting local youth, and is also a great way to encourage individuals, couples and families to be physically active. 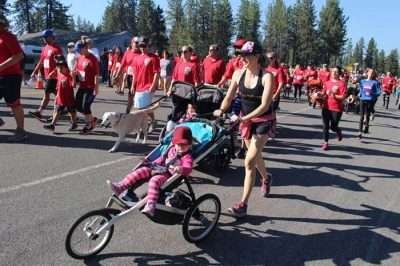 With the help of many volunteers and sponsorships, including Holiday Market, Flooring Brothers, Collins Pine Co., CHP, Slusher Plumbing, Lake Almanor Fitness Center, Olah Construction, Edward Jones Investments-Carla Parsons and Lassen Peak Photography, the morning competition went off without a hitch, he said. Fruit, sports drinks and water were provided to the participants afterward. Competitive runners race specifically to win, and have their runs timed accurately by Under The Sun Events of Chico, a full service race management and timing company. Some participants chose instead to walk the route or push baby strollers behind the racers. Still others included the family dog walking in stride along with their owners. 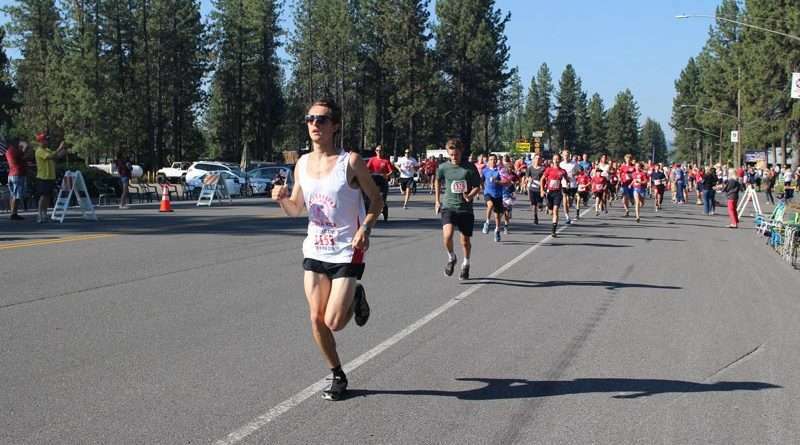 First place in the men’s division went to last year’s winner, Matt Paulsen, 22, of Reno, with a time of 18:21.5. Britta Bundy, 17, of Chico, won first place in the women’s division with a time of 21:46.2. Complete race results for all participants can be found at: chesterfunrun.org, or underthesunevents.org. The Almanor Recreation and Park District is unfunded and all the board members volunteer their time as a community service. 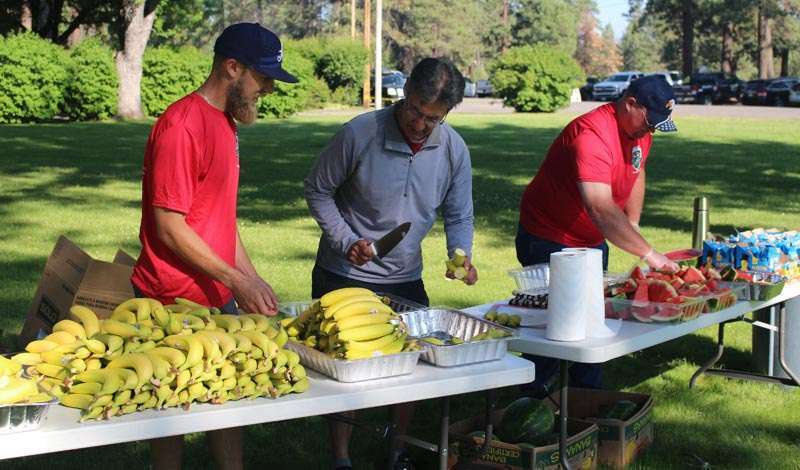 From left, David Slusher, Carlos Espana and Peter Strand prepare fruit and drinks for the runners after the race. A number of participants in the Classic Fourth of July Fun Run & Walk decide to include the family dog in the activities. 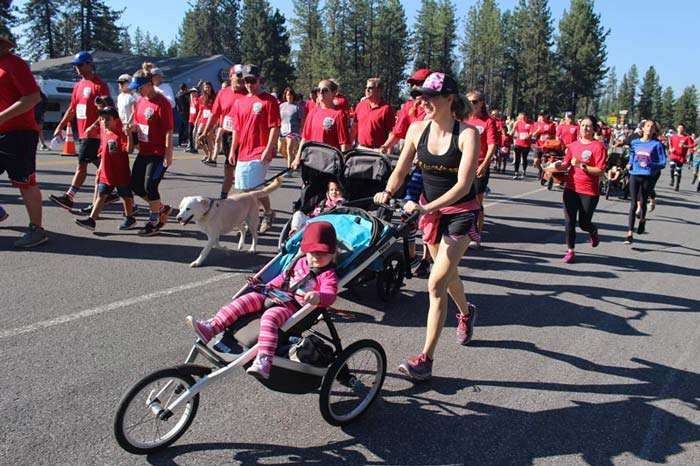 Some participants choose to push baby strollers behind the racers instead of going full bore at the Chester Fun Run & Walk on July 4th. From left, Santa Barbara residents Jason Wheeler with son J.T., daughter Morgan and mom Lena. The Wheelers said this was their first time competing in the Chester Fun Run, but stated they looked forward to returning again next year. Although both said they love to go camping in Plumas County once a year, this is the second time that Molly Lindsay from San Diego entered the Classic 4th of July Fun Run, with boyfriend and fellow sprinter Brock Jones. 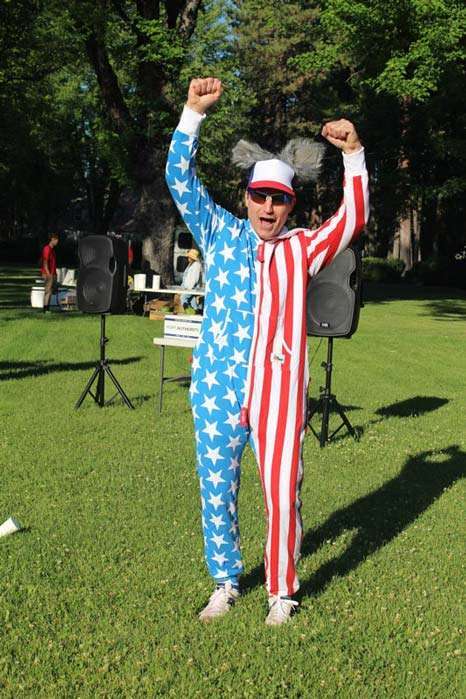 Shane Bergmann is decked out in his Independence Day best during the 39th Chester Classic 4th of July Fun Run & Walk. The foot race broke its own record, 680 runners participating in the competition.